When you have a big list of things to do you need a big to do list note pad! Feel organised and get your to do list under control with this A5 Today's To Do List To Live Happy note pad. There are 15 rows to write on, each with a box for that satisfying tick when you've accomplished the task. The rows are categorised too so you can prioritise your long list into what's essential to get done and what can wait a bit longer. 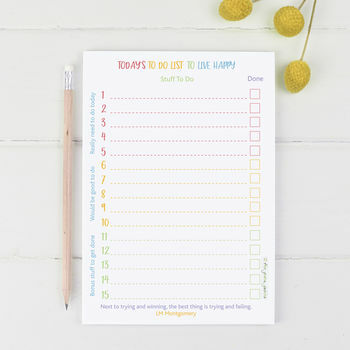 The to do list note pad is A5 in size and the design is printed on all 50 pages in the note pad. The pages are printed on 100% recycled 90gsm paper with a recycled back board in the UK. You can order the co-ordinating A5 Weekly Meal Planner Pad at the same time and save a little bit of money! The note pad is printed on 100% recycled paper. The note pad measures approx 21cm tall x 14.8cm wide.